Sober Look: LIBOR manipulation: "dude, you’re killing us"
LIBOR manipulation: "dude, you’re killing us"
[another conversation] “I really need a very very low 3m fixing on Monday – preferably we get kicked out. We have about 80 yards [billion] fixing for the desk and each 0.1 [one basis point] lower in the fix is a huge help for us. So 4.90 or lower would be fantastic”. 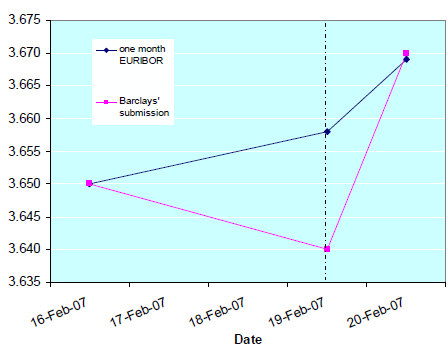 Here is an example of Barclays manipulation of EURIBOR in 2007. Hard to argue against this type of evidence. And much much more in the document.